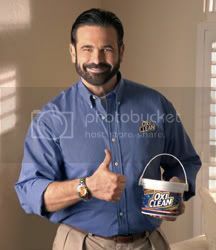 Billy Mays III, the son of the popular pitch man that popularized prduct such as Oxy Clean and Kaboom is hosting a costume party in honor of his dead father. “Halloween is approaching rapidly and it goes without saying that “deceased celebrities” (and balloon boy) will most likely be a huge theme at every gathering. Billy wants people to send him pics of their Billy getups — the winner gets a bunch of prizes … including, of course, a tub of OxiClean. Billy Mays III want everyone to send him pictures of their Billy Mays costume, the winner of the said contest will get a whole buch of prizes include of course a bucket of Oxy Clean which was the product that made his dad popular.